Rent villas and apartments in Praia da Oura, Algarve with private pools. Book affordable holiday rentals that are near a beach and golf course. 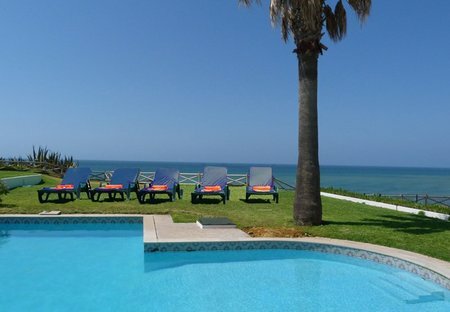 This 5 bedroom villa is located in Praia da Oura and sleeps 12 people. Casa Vivenda Caterina is a newly renovated five bedroom villa in a superb location, next to the beach and within an easy walk of shops, restaurants and bars. This apartment should meet all your holiday needs in terms of the lovely 2 bedroom spacious apartment and the vibrant location. TI Bicos J is a one bedroom apartment which has an extra room which can be used as a sleeping room if required. The apartment has the capacity to sleep 4 people. This is a one bedroom apartment and has rhe capacity to sleep 4 people. centrally located so it is not essential to have a car as the beach and amenities are within minutes away. A centrally located apartment on the ground floor of a modern build. T1 Bicos 101 has the capacity to sleep 4 people. 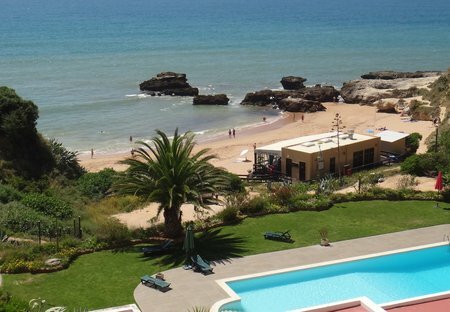 T2 Bicos R is a 2 bedroom apartment is a great location in Albufeira. It has the capacity to sleep 6 people. Just 3 minutes away from the beach of Praia da Oura and with direct access to Praia dos Bicos through the urbanization, Vila Santa Eulália, is built in the high point of complete tranquility. Apartment with two bedrooms, two baths, living room and equipped kitchen, three balconies, garden and pool, located in the center of Santa Eulalia - Oura in Albufeira, just 300meters from beach. With stunning views of the Atlantic Ocean, Villa Ruinas sits in extensive grounds within walking distance of the closest Beach. Close to Albufeira. This 5-bedroom villa for up to 12 guests is located in Albufeira Centre and has a private swimming pool and. Luxury apartment Abufeira with sea view. The Villa is an attractive holiday villa near Praia dos Aveiros, with a spacious garden and a pool area with fences ideal for couples with young children. Wi-fi and A/c are also available.